After lunch we will get back on the bus and go to the city center and experience the city of Pitigliano, and take a walk through the Borgo and it’s charming streets. Bring your cameras! ➡ 12:30 – Arrival at Villa Corano. They will take us to the vineyard’s and oil trees describing the features of the grape & territory. Also show us the canteen where they will explain the process of wine making. The tour will be an hour long, and there will be free time to buy some wine, oil, and cheese to take home! You can buy products that will be available vacuum packed. They ship worldwide! ➡ 14:30 – On our way to Pitigliano and this is your free time to see the city, take pictures! ➡ 18:00 – Meeting point is at the shuttle bus. Please be on time. Use toilets before to avoid stopping on the way. It’s 2 hour drive and expected time of arrival is 20:00. €48 – PICK UP ONLY at our event on Tuesday nights at Testaccio at Rec23 Restaurant Emporio Club from 20:00 -23:00. 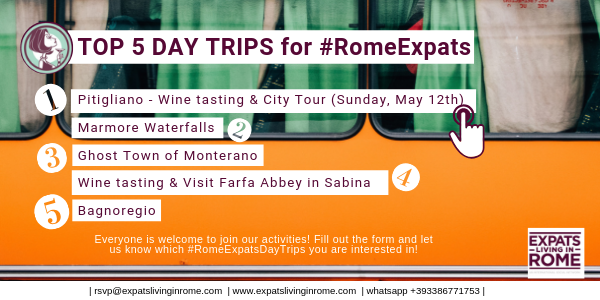 Please email us at rsvp@expatslivinginrome.com and let us know how many tickets to hold for pickup. €60 – Ticket at the bus.